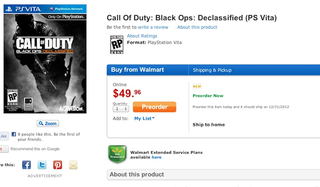 Mega-retailers Wal-Mart and Amazon have posted product information pages for Call of Duty: Black Ops: Declassified, the Vita-only version of Activision's popular shooter franchise. The game is described as featuring an all-new campaign of "Special Ops Missions," as well as multiplayer tailored to the Vita. It's listed for $50, which is $10 more than most Vita games. UPDATE - Activision PR has confirmed both the box art and info blurb, sending through this higher-res image.